1 of 2 Fill a small pot with 2 inches of water. Bring to a simmer. In a metal bowl large enough to fit over pot, whisk together wine and sugar. Add in egg yolks, whisking constantly over simmering water until mixture is frothy and thickens, about 5 minutes. (Temperature should reach 165 degrees .) Be careful not to scramble yolks. 2 of 2 In a large bowl, toss together blackberries, blueberries, raspberries and diced strawberries. Distribute among 6 glasses. 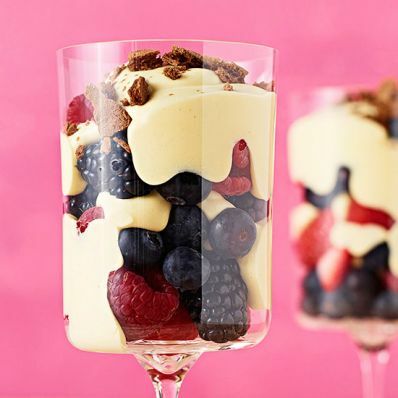 Spoon sabayon over berries. Garnish with crushed cookies. Serve warm or chilled.